I slept (or at the very least lightly dozed) through my required Art History course in college (I think it was 20th century impressionists?). It was an early morning class (9 am), in a small, slightly too-warm room, with the lights off, and the whir of an over-head projector that cast slightly out-of-focus French impressionists on the wall. I think they were French impressionists, I don’t really remember much of the class. I enjoy art — interesting art, art in museums, art in galleries, art in cathedrals, art on calendars — not art viewed through a noisy over-head projector. I love Calder’s mobiles, Escher’s pen-and-ink, Cabanel’s Birth of Venus, Hundertwasser’s architecture, and most everything painted by Klimt… and none of that was covered in my Art History class. I also enjoy an interesting story, and The Art of Forgery, manages to combine interesting art and interesting stories in a brilliant way. 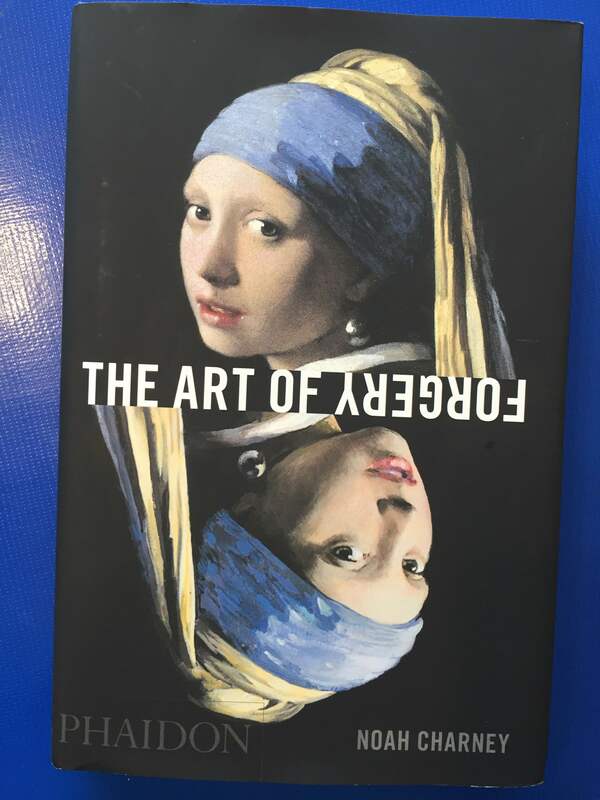 Neatly divided into the eight reasons people forge art –genius, pride, revenge, fame, crime, opportunism, money and power– Charney then gives provides several examples of each, in a concise, informative and interesting way. The end result is a fabulous read, with clearly demarcated stopping points (this is useful when small children suddenly need mommy urgently). Charney covers a range of forgers, from Roman times, when Hellenistic art was in high demand, to more recent times, and touches on some non-art forgeries as well, discussing the methodology used to create forgeries, as well as the technology used to uncover them. Part true-crime, part art history, all interesting, and the images in the book are beautiful. The book itself is also delightful, a heavy volume, with nice thick paper, a very nice contrast to the bargain paperbacks that usually clutter my nightstand. Many thanks to my MIL (and my husband who helped her pick it out) for a fabulous birthday present! Would read again, would recommend. I came across Hundertwasser architechture with Cousin Susann, Tante Inge and Mom last summer when we were in the Ahrtal … and had coffee, tee & Kuchen amid the vineyards. Amazing.